This is a guest post written by Rob Thijssen. First, do you really want a chain drive system? They require regular cleaning, maintenance and occasional replacement. Cleaning is a weekly job (if you ride most days). More frequent if you're riding in a wet or dirty environment and perhaps less if you only ride in great weather on clean roads. It takes 10 minutes when you're good at it and up to 45 when you aren't. Its not complicated and doing it regularly will quickly make you good at it. Maintenance involves lubricating the chain and adjusting the tension. This needs doing roughly every two weeks. The adjustment is usually to tighten the chain although I guess it could happen that you need to loosen it, but this only happens to me if I've already over-tightened. The process involves using a wrench too large to keep in the under-seat tool wrap, to loosen the rear axle nut and then fiddling with the tensioner nuts until the chain is at the tension I like it at. Most guides recommend an inch of play (between how high and how low you can position the lower half of the chain at its midpoint between front and rear sprockets) but your owners manual may give more precise instructions. When you've ridden the bike a while, you'll develop a knack for where the sweet spot is in the chain tension. Too loose and you'll feel it rattling and clanging about in vibrations through the footrest. Too tight and you'll strain the engine and stress (stretch) the chain early, resulting in the same feelings gathered in the too loose column. When you re-tighten the rear axle nut, you have to do it to a precise tension using a torque wrench. The job takes 10 minutes but probably a half hour when you're getting used to it. Replacing the chain happens infrequently, but expect it to need doing if you've just bought a second hand bike. Most people don't spank on a shiny new set of x-rings right before they flog their machine. They might clean, oil and tension, but the generosity likely ends there. 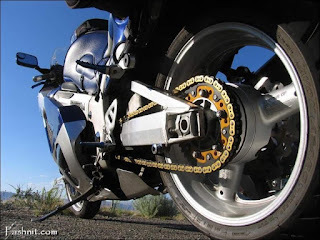 When you do the chain, you might as well do the sprockets too, because they wear at a similar pace and you're going to be in the vicinity anyway. You need to remove the rear wheel using the aforementioned giant wrench on the rear axle nut again and the front sprocket nut will test your resolve and make you question your manliness. It's bloody tight and usually stuck because the motion of the gears works to tighten the sprocket on its mount. You need a special tool for separating the removable chain link and the job is a messy, dirty one. Expect it to take between 45 minutes and two hours. In choosing replacement parts, Google and the internets will tell you that D.I.D. Supersprox are where your OCD tendencies will want you to go, but your wallet may have other ideas. In terms of tech: O-ring is better than non-O-ring and X-ring is better than O-ring (see here for a diagram). Go with your gut. If any of that put you off, don't despair. It turns out that you are a shaft-drive rider. Shaft drives do not require any of the fussing described above. They may be pricey if they go wrong, but I've never met someone who had this experience. Older shaft-drives may not be as fast as their chain driven contemporaries and some riders report momentary lock-ups when gearing down, but in a good modern machine, they simply eliminate chain related hassles. Having said that, there are very few race bikes about what use shafts to make all the stupid grins you see at the TT. What are your thoughts on chains vs shaft drive?